We’d love your help. Let us know what’s wrong with this preview of Arklight by J.M. Myrick. Arklight, the best kept secret in the U.S. arsenal, stumbles upon a power that exists independent of time. While on mission to capture the world’s most wanted terrorist, Arklight’s Spear Team unearths a remarkable Nazi conspiracy. The mysterious interaction leads the team to locate a dangerous truth, including a sinister plot to locate a weapon of immense potential. An encounter beyond belief forces the team back in time, one day into the WW II Allied assault on Bizerte, Tunisia. They soon discover an extraordinary purpose, forming an uneasy alliance of necessity. In 1943, Hitler’s deranged attempt to conquer Europe, and beyond, stands on the fringe of reality, but Arklight provides the world a chance to alter destiny itself. Broken men experience a brutal truth, unlike anything before it in human history, creating an incredible revelation. The past we have always known becomes a paradox of faith, reshaping fact and reality. An ancient Knights Templar calling comes to light, uncloaking a dark enemy’s ominous plan to destroy all things. To ask other readers questions about Arklight, please sign up. *Be sure to check out my blog post for this book! Wow. This book blew me away. It's been a long time since I've read a really, really good book, but this one definitely grabbed me. I love strong Christian novels, and this one is fantastic. With elements of classics like those by Dan Brown, mixed with the ever-popular Knights Templar legends, there wasn't much of a chance of me disliking this story. Each chapter started with a scripture, guiding the reader in a clever way, eluding to what was coming *Be sure to check out my blog post for this book! *I was given a complimentary eCopy of this book, from the author, to read in exchange for an honest review. They say to not judge a book by its cover, but I initially became interested in reading “Arklight: Operation Nightfall” because the cover art looked brilliant. Happily, the story underneath the cover was brilliant too. Told from third person perspective from the point of view of several different characters, “Arklight” takes place in both 2016 and 1943. In 2016, we meet Arklight’s covert Spear Team on a mission to capture a high-profile terrorist. In 1943, we’re introduced to an analogous militar They say to not judge a book by its cover, but I initially became interested in reading “Arklight: Operation Nightfall” because the cover art looked brilliant. Happily, the story underneath the cover was brilliant too. Told from third person perspective from the point of view of several different characters, “Arklight” takes place in both 2016 and 1943. In 2016, we meet Arklight’s covert Spear Team on a mission to capture a high-profile terrorist. In 1943, we’re introduced to an analogous military team led by John Bell in the midst of World War II. These separate time periods collide when Spear Team is supernaturally transported back in time, in an effort to stop Hitler from creating a powerful weapon that could turn the tide of history. The story that unfolds incorporates an ancient Knights Templar journal, Nazi soldiers, lost artwork, modern-day terrorists, tactical action scenes, and— overarching everything—belief in a higher power to tell its inspired tale. If it needs a comparison, then think a Tom Clancy – Indiana Jones crossover with religious themes – but I think the novel and the author are distinctive in their own right! As I mentioned, I thought this novel was really pretty brilliant. For a debut novel, it doesn’t read like one. The dialogue sounds believable and natural; there are a number of interesting plot points that keep the story moving quickly along; and the action sequences are precise, absorbing, and clearly detailed by someone with the experience to write them realistically. There are a few grammatical errors throughout the book, but nothing overwhelming that couldn’t be corrected in the second (and third and fourth and...) printing. The characters are fairly numerous, which can sometimes lead to character development that’s spread too thin, but I think in this novel you uncover just enough of each character to recognize how they’re important to the story. And the story itself— which blends military, history, time travel, and faith— is very unique! Without revealing important plot points, one of the principal themes of “Arklight” is faith in God. Some of the characters have it, and some don’t. When these characters interact on the subject of faith, they seem to be mostly respectful of their individual beliefs/non-beliefs, and I found that to be refreshing. God as an unseen character is entrenched in the story and Christianity is prevalent, but the incorporation of Christian themes did not (at least in my opinion) feel heavy-handed or “cheesy” in the way that some Christian-based media can, and I think that’s an impressive feat to pull off in writing. After finishing “Arklight: Operation Nightfall”, I’m looking forward to reading the sequel to find out where and who Spear Team engages in the next installment! Also, should it ever get that far, I think “Arklight” would make for an action-packed and inspiring film, and I’m looking forward to that too. Arklight: Operation Nightfall. I saw this book being promoted by Booktasters on Twitter. The site connected me with the author and he was kind enough to give me a free PDF copy of his book. I have been reading wayyy too many YA Lit. I wanted OUT (at least for a while) of the love triangles and lovey-dovey relationship themes that YA almost always falls into. I wanted something gripping, thought provoking and with cool and believable fight scenes. I I got all of that when reading Arklight: Operat Arklight: Operation Nightfall. I saw this book being promoted by Booktasters on Twitter. The site connected me with the author and he was kind enough to give me a free PDF copy of his book. I have been reading wayyy too many YA Lit. I wanted OUT (at least for a while) of the love triangles and lovey-dovey relationship themes that YA almost always falls into. I wanted something gripping, thought provoking and with cool and believable fight scenes. I I got all of that when reading Arklight: Operation Nightfall. I appreciated that although it was a military sci-fi book, it didn't contain cuss words in every page. I noted 1 damn and 1 sob, nothing too unbearable. I also liked that the author didn't use too obstuse and pretentious vocabulary in his book. I think that helped it be a quick read. Because I was so hungry to dive into something out of the norm for my bookish tastes, I felt this book to be rather fast paced. And indeed it was only about 275 pages, so, the brevity of it did help a lot with flying through the book. Each chapter had an element of mystery that could only be unraveled by reading the next chapter. It had an interesting approach to military sci-fi, religious supernatural elements, time travel & historical fiction. I am always on my toes when reading time traveling books (especially when historical fiction is poured into the mix) because these themes in books can sometimes be rather challenging to keep up with but, I was glad that when reading this book, I didn’t encounter that issue too too much; the plot was pretty straightforward and after finishing each chapter, a piece of the puzzle was put in place to help solve mystery behind Arklight and the character known as Pappy. I enjoyed the playful banter between the guys, it helped lighten the serious tones in the book. Doc and Sam’s deaths were difficult to read about; the mental fortitude that these soldiers had to develop on the battle field was really admiring and it made me think about real life soldiers and what they have to go through just for them to come back home safe. Just thinking about this reality is emotionally moving and I’m grateful that this book provoked those emotions because it made me feel thankful that I don’t live in a war torn country or in a country that has to go to war with any of its neighboring countries. I was happy that John was able to meet the younger version of his grandfather and when coming back to the present, he was able to realize that the time he had with his grandfather was precious and that he needed to think about spending more time with him. Chappy’s character development was endearing; I’m glad he didn’t stay incredulous to the possibility of the supernatural forces at play in the book. Mohammad’s change was funny to see; big shot terrorist turned soft. I’ve never seen a happier captured terrorist. I felt as anxious as Nathan as I tried to piece together everything that was happening in the book, it was a big relief when everything was put in place. I have to say, when I started Arklight, I was a little overwhelmed. I grew up in a military family so the terminology and persona of the characters were familiar, but the plot surprised me. The author is a former Marine, so you know he knows his stuff! That's one thing I enjoyed, an actual service member writing a fictional novel. The characters development throughout the novel was fast but not too overwhelming. Each character had his own strengths, which is shown in excellent detail. You have J I have to say, when I started Arklight, I was a little overwhelmed. I grew up in a military family so the terminology and persona of the characters were familiar, but the plot surprised me. The author is a former Marine, so you know he knows his stuff! That's one thing I enjoyed, an actual service member writing a fictional novel. I loved the time travel between 2016 and 1943. You see how the soldiers react to being thrown into the middle of WWII. But HOW they went through time was a surprise to me. I never expected a military based book to have some Religion thrown into the mix. I couldn't quite wrap my brain around this combination, but it seemed to thread together quite nicely. Now I am very particular about religious books and tend not to really enjoy them, but I quite enjoyed this and will be waiting for book 2 to be available. This is a book that if you're interested in literature in War, you will find it that you can't keep the book down. Myrick has written a thriller. A perfect companion if you're travelling on a train or a long distance flight. I literally read through the book not minding all the distractions around. The best part about this book is the magical intertwining of the present, the past and the future. This book heavily relies on Christian mythology developing in parallel with the storyline which will d This is a book that if you're interested in literature in War, you will find it that you can't keep the book down. Myrick has written a thriller. A perfect companion if you're travelling on a train or a long distance flight. I literally read through the book not minding all the distractions around. The best part about this book is the magical intertwining of the present, the past and the future. This book heavily relies on Christian mythology developing in parallel with the storyline which will definitely make it a crowd favourite among the faithful. Otherwise, you will be hooked to the story by the narrative and the raw feeling of adrenaline while anticipating the death of a few Nazis!! Books, like movies are not many alike. Depending on the genre you may like it or not. Still, both of them require quite a lot of work to put together. Writing a book is not an easy task and not many have what it takes to do it. J.M.Myrick has an interesting story to tell, I cannot deny that, and I can see it put together on the big screen. For action movie fans it is a treat. But for a book, it needs a little more than just action. The writing style feels like a police report, especially at the begin Books, like movies are not many alike. Depending on the genre you may like it or not. The writing style feels like a police report, especially at the beginning of the book. If you are not familiar with the military terms, you need to get familiar to follow through. The characters are not developed, beside their names there is no proper description behind them. They pop in and out of the story and while for a movie this works, in a book you expect more structure and details. The language is specific, some editors call it officialese and many consider it a blight in a book. Therefore the book can be intended for a target audience, people who have military background and absolutely love combat stories. I'm not usually a fan of historical fiction, but this story kept me wanting more. The collision of present with past was so well written. I can't stand the wait for the next book. An interesting way of exploring WWII history! A full review is available on my website. To everything there must be a balance, to the forces of evil, there must rise a counterforce of good. The plans for an ultimate weapon have been uncovered, and there are those who drive for its completion, drive for a world of scientific supremacy and destroy all would dare obstruct, challenge, or stand against them. They are the dark, and Arklight is a force for God, defending the light. Rescuing the brilliant mathematician Professor Amaldi was just the beginning, coding and hidden messages in To everything there must be a balance, to the forces of evil, there must rise a counterforce of good. The plans for an ultimate weapon have been uncovered, and there are those who drive for its completion, drive for a world of scientific supremacy and destroy all would dare obstruct, challenge, or stand against them. They are the dark, and Arklight is a force for God, defending the light. Rescuing the brilliant mathematician Professor Amaldi was just the beginning, coding and hidden messages in artwork bring more questions than answers, but one thing is certain, what they discover cannot be allowed to fall into enemy hands. The very future hangs in the balance, as past, present, and future unite to fight the most important battle of all time. I am thankful to any who put pen to paper and write a book, a true story. This was a good read due to the mixture of military and history. The content was interesting, you really got to know the characters and their strength. Also to have Faith. J.M. Myrick has a talent for description and well-constructed plot. Crafting a gripping action scene is a difficult task, but Operation Nightfall does it well. The content is quite good but the writing style is quite mechanical.. I enjoyed the last part of the story but first part was quite slow.. This review has been hidden because it contains spoilers. To view it, click here. 2018 Readers’ Favorite Bronze Medal Winner! Arklight: Operation Nightfall by JM Myrick is a compelling story involving covert military missions, WWII, time travel, God, and strong religious themes. The Arklight’s Spear Team is a powerful unit in the US military, a group of well-trained professional soldiers who only respond to the executive branch of the government. No one knows how it came to be. Now, this unit is on a secret mission to root out on 2018 Readers’ Favorite Bronze Medal Winner! 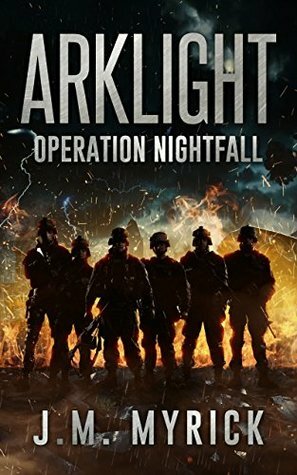 Arklight: Operation Nightfall by JM Myrick is a compelling story involving covert military missions, WWII, time travel, God, and strong religious themes. The Arklight’s Spear Team is a powerful unit in the US military, a group of well-trained professional soldiers who only respond to the executive branch of the government. No one knows how it came to be. Now, this unit is on a secret mission to root out one of the world’s most wanted terrorists, seventy-three years after WWII. But Captain John Steadman and his team find themselves transported to 1943 where they witness a Nazi conspiracy. But what is most shocking is the discovery of a powerful artifact, a weapon linked to Christ — Titulus Crucis. Instead of hunting a terrorist, this team becomes embroiled with a power that alters Hitler’s plans and the course of history. Good writing with lots of action. .A bit heavy on the religious content for my likes, but an enjoyable read to be sure.